These were growing in the deep shade of a canyon in among rather thick brush, which perhaps accounts for their unusually deep color. It is described on the Burke Museum website as “more or less prickly or nearly unarmed”, and these had no thorns or prickles at all which was a pleasant surprise. Oh, that sure is pretty!! Thanks! 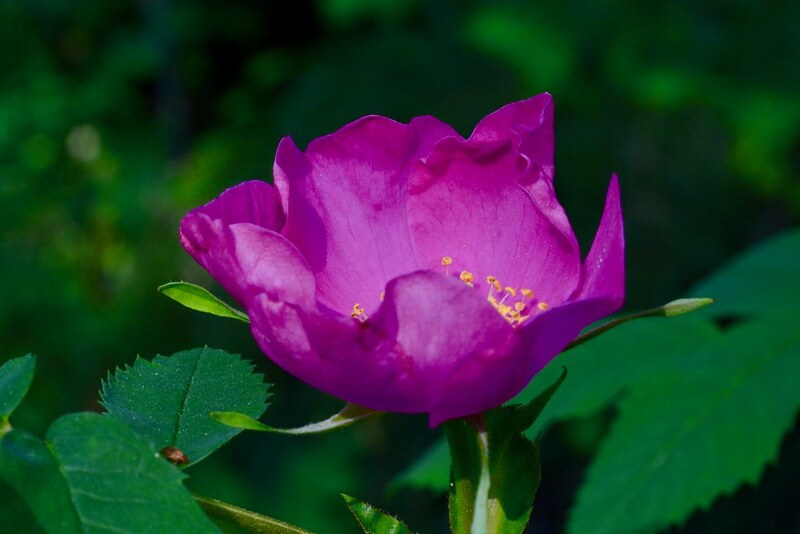 It’s hard to beat the wild roses! The look especially nice early in the summer before it gets too hot, and they really brighten up a trail. No good for my Sleeping Beauty Castle if it has no thorns. But it sure is pretty. I find it interesting that within the species, some have thorns, some have prickles, and some like this one, have no armament at all. Seems to be like the blackberries. I have thornless blackberries (bought from the nursery) growing in my fenced garden and the regular killer thorned ones in my backyard. For some reason this species varies in the amount of weaponry it displays. As far as I’m concerned it makes it a more pleasant species. The colour is beautiful; much nicer than their pale cousins. There are color variations within this species and this one was dark and rich. I don’t know why. It does have beautiful color, deep and rich. 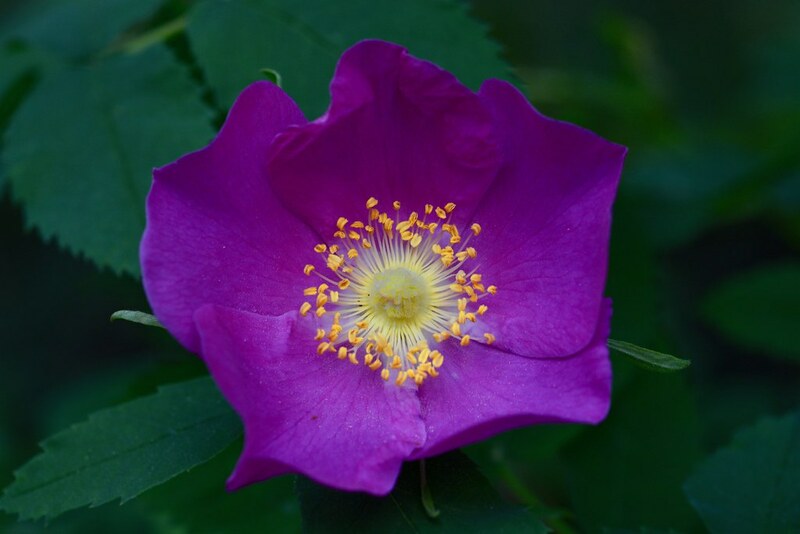 This is the most colorful of all the wild roses around here. They really stand out! What a beautiful rose and great images of it too. Coming across these beauties in the wild would be a real treat. This one is a deeper color, but not as prevalent as the others which are blanketing the edges of the brush now. It is a good year for wildflowers! Pretty captures, the bud is gorgeous! Thanks. 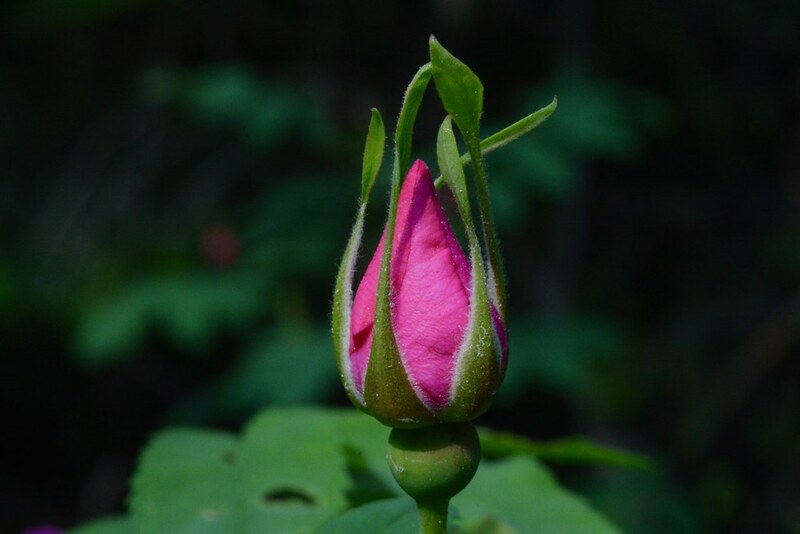 There are still a lot of buds and each is posed differently. I can’t pass them up. The do look a little like jewelry among the leaves of the shrubbery and tall grasses. No all in this species are this vivid, but they really stand out among the others.